You will receive a warm welcome from our dedicated, friendly staff. We look forward to getting to know you and to helping you find better health. 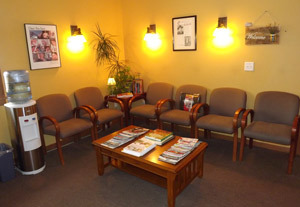 Take a seat in our comfortable waiting area. You can find the necessary paperwork on our website and bring it in with you completed. These forms can also be filled out once you arrive. Our staff is ready to answer any questions you have and determine your insurance coverage. Dr. Steve Abeler will perform a thorough examination. If we feel X-rays are necessary, we will send you to a nearby facility to have them taken. If you’re in pain we’ll address your needs right away on this visit. You can wear your regular clothes to your appointment. A loose shirt is best and we usually do not need our patients to put on a gown. If you bring your paperwork in completed, this visit will take about 45 minutes. If you choose to fill out forms when you arrive, it will take about an hour. You will fully understand what is causing your pain and our plan to get your health back. The formal adjusting process starts on this day. We are ready to answer any questions you might have about chiropractic care. Contact us today!